Our Low Orbit Helium Assisted Navigator (LOHAN) project reached a major milestone over the weekend with the completion of the first Special Project Electronic Altitude Release System (SPEARS) control board. Neil Barnes, who put together LOHAN's silicon heart with the able assistance of Anthony Stirk, reports that the beast is working as advertised. The primary function of SPEARS is to use GPS-determined altitude to fire the solid rocket motor of our Vulture 2 spaceplane, but it'll also log flight data, as well as reporting its position via radio for tracking purposes. 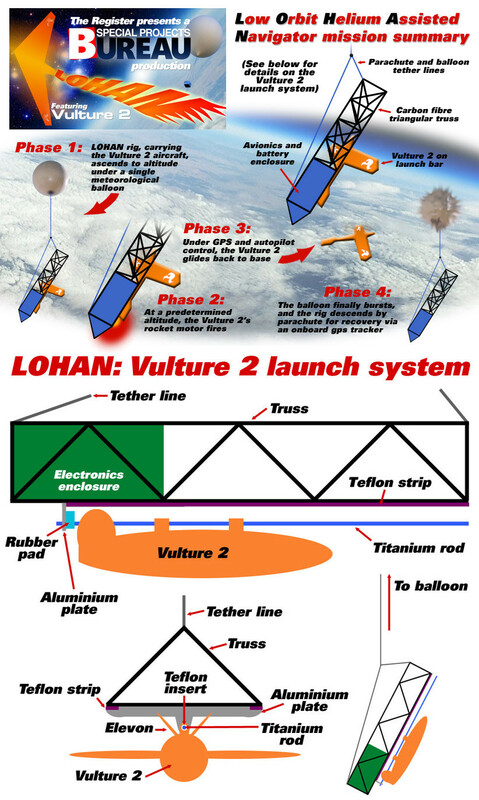 SPEARS is based on Anthony's Swift High Altitude Ballooning (HAB) system, although it has been heavily modified to meet LOHAN mission requirements. The brown and red wires apparently emerging from the end of the LOHAN logo's fiery tail are connected to an auxiliary serial data output, which will eventually hook up with the RockBLOCK Iridium satellite comms unit. That's not an immediate priority, as we're concentrating on SPEARS' primary function, which is a simple enough proposition. 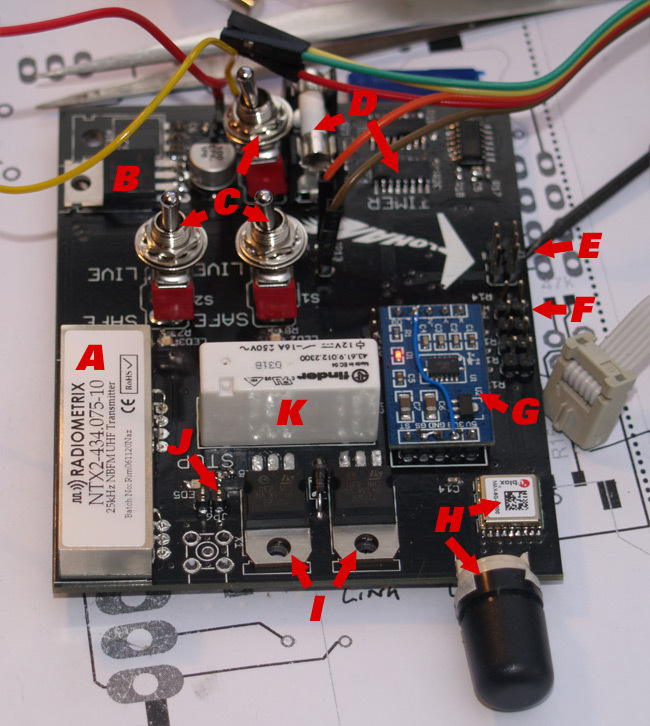 At an altitude of [classified], as detected by the uBlox MAX-6, the board triggers the firing relay via the firing relay driver transistors. 12 volts surge from the igniter battery pack to the Vulture 2 custom motor igniter, and Bob's your uncle. SPEARS is programmed to issue the launch command only if the current altitude is above 20,000 metres (to be clear of air traffic) and we achieve the desired launch height. Furthermore, SPEARS will hold the launch if the fantastical flying truss bearing the spaceplane is not stable at the predetermined altitude. The accelerometer* will detect any heavy turbulence which might prejudice a successful blast-off . It's worth noting that in "flight" mode, the uBlox is good to 50,000m (164,000ft). For those of you who haven't seen our previous notes on the matter, GPS chips aren't actually restricted to an altitude of 18,000m (59,00ft) or a velocity of 515m/s (1,152mph), but rather 18,000m and 515m/s. For launching we enable things a step at a time. If at any time, we don't see the lights we expect, and in particular if we see the 'STOP' light, we abort. We start with the power disconnected from the board and the igniter cable disconnected. Set all three switches off - this should give two yellow 'SAFE' lights. It disconnects power from both the relay coil and the relay contacts, and resets and stops the timer. Turn S1 on: this powers the coil side of the relay and sets its red 'LIVE' light. 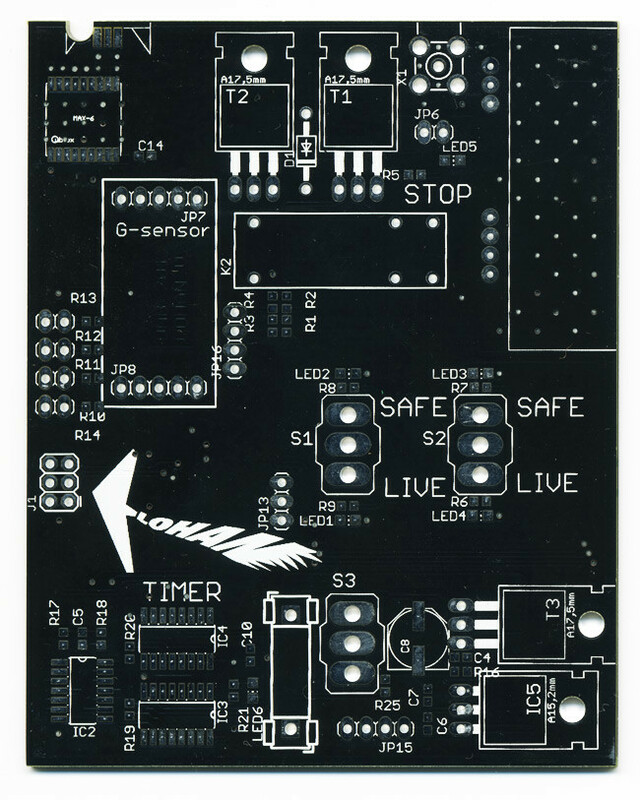 Turn S2 on: this powers the contact side of the relay, and sets its red 'LIVE' light. If there is a contact fault in the relay, this will light the 'STOP' light. That indicates that the igniter contact is live; it's a bad idea to attach the igniter at this point. If we're happy with just two red lights, we can attach the igniter. The final act, just before we launch, is to turn S3 on, which starts the timer - look for a flashing 'TIMER' light. The timer set-up is intended to completely disable the ignition system after roughly two-and-a-half hours, should the Vulture 2 for any reason return to terra firma with the flying truss. This minimises risk in the unlikely event that some hapless member of the public stumbles across LOHAN before we get to the landing site. 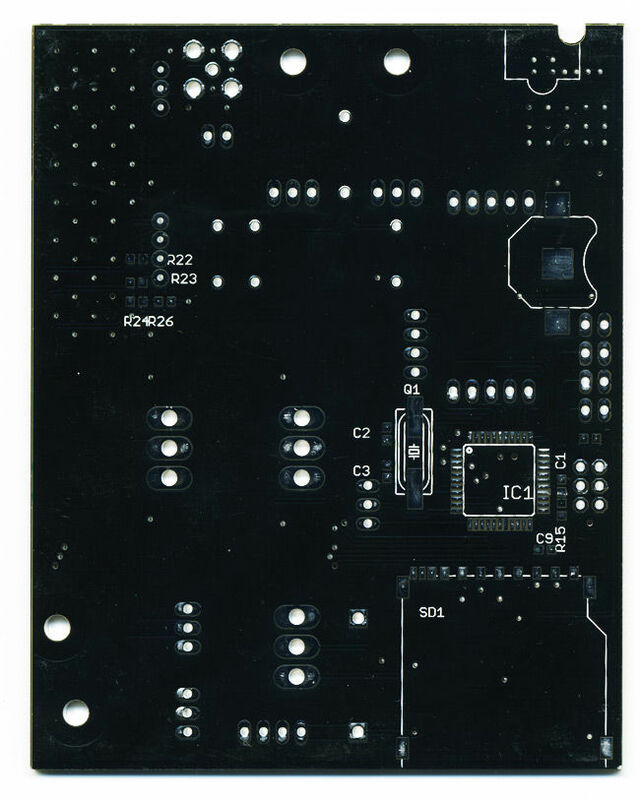 The system is entirely independent to the SPEARS microprocessor, and is powered by the 12V igniter batteries. The timer circuitry starts running as soon as the aforementioned Switch 3 is flipped. Once it times out, it fires the triac which shorts (crowbars) the 12V supply, blowing the fuse. The position of the flying truss will be sent regularly by the Radiometrix UHF transmitter, which offers standard licence-exempt frequencies of 434.075MHz, 434.650MHz (EU) and 458.700MHz (UK). If all that wasn't enough, SPEARS records flight data to an SD card, so we'll have a complete record of position/speed/altitude, accelerometer readings, and temperature from three sensors, the exact positioning of which is yet to be decided. Thanks very much to Babelduck for helping us out with the accelerometers. It's much appreciated chaps. New to LOHAN? Try this mission summary for enlightenment. Join the expert LOHAN debate down at Reg forums. All the LOHAN and Paper Aircraft Released Into Space (PARIS) vids live on YouTube. For our SPB photo archive, proceed directly to Flickr. Vulture 2 spaceplane in a comic book stylee – what do you think?